"Gunny" redirects here. For the fabric, see Gunny cloth and Gunny sack. Gunnery sergeants in infantry and reconnaissance units typically serve in the billet of "company gunnery sergeant" or as the platoon sergeant of 23 - 69 Marines in a reconnaissance platoon or a crew-served weapons platoon (i.e., machine guns, mortars, assault weapons/rockets, and anti-tank missiles). In artillery batteries gunnery sergeants serve as the "battery gunnery sergeant" in the headquarters section of the firing battery's 94-member firing platoon. In tank and assault amphibian units gunnery sergeants may serve as a platoon sergeant of a 16-member platoon of four tanks or a 39-member platoon of 12 AAVs, respectively. Tank and assault amphibian gunnery sergeants are also assigned as section leaders, in charge of either two tanks and 8 Marines or three AAVs and 9 Marines, respectively. Gunnery sergeants serving as platoon sergeants perform essentially the same duties as staff sergeant platoon sergeants, with the additional responsibility of supervising other staff non-commissioned officers (i.e., the gunnery/staff sergeants leading the organic sections of the platoon). The company/battery "gunny" serves as the unit's operations chief and works with the Executive Officer to plan and coordinate unit training and operations. In combat, as a member of the unit's command group, he/she serves as a tactical adviser to the commanding officer/battery commander regarding employment of the unit and assists in operating the command post or tactical operations center. 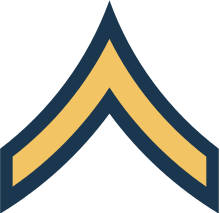 In garrison, he/she is responsible to the company/battery commander for supervising and coordinating individual training for the enlisted members of the company or battery and may assist the company/battery first sergeant in the administration and non-tactical leadership of the unit and by supervising the Property NCO, advising the officers, mentoring subordinate ranking Marines, and performing other duties as assigned. The Company/Battery "Gunny" has been described as a "hands on disciplinarian". An approximate former equivalent in the US Army would have been "field first sergeant". Gunnery sergeants also serve as senior staff non-commissioned officers in military staff sections and headquarters and service companies and headquarters batteries at battalion/squadron, regiment/group, and division/wing headquarters levels. Typical gunnery sergeant billets in combat support companies and battalion, regiment, and division headquarters are: Personnel Administration Chief, Staff Secretary Personnel/Administration Clerk, Administration Assistance Chief, Division Reproduction NCO, Equal Opportunity Advisor, Human Affairs NCO, Career Planner, Intelligence Chief, Operations Chief, Operations Assistant, Watch Team NCOIC, Schools Coordinator, MAGTF Plans Chief, Cinematography Specialist, Logistics Chief, Embarkation Chief, Infantry Weapons Chief, Analyst and Review Fiscal Chief, Information Systems Maintenance Chief, Public Affairs Chief, Communications-Electronics Maintenance Section Chief, Radio Chief, Wire Chief, Motor Transport Chief, Battery Motor Transport Chief, Roadmaster, Assistant Roadmaster, Maintenance Chief, Assistant Maintenance Chief, Management Team Inspector, Engineer Equipment Chief, and Mess Manager. In Command Element, Combat Logistics Element, and Aviation Combat Element organizations, gunnery sergeants serve in basically similar positions of responsibility, authority, and accountability as their Ground Combat Element counterparts, with perhaps slightly different titles, such as Division/Branch Chief/NCOIC or Department SNCOIC (Staff Non-Commissioned Officer-In-Charge) in the aircraft maintenance department of a Marine aircraft squadron. Non Fleet Marine Force (or other operating forces) assignments may include supervisory or staff positions in recruiting, drill instructor, Marine Security Guard, Naval ROTC instructor or service school instructor, and major/joint/combined headquarters commands. 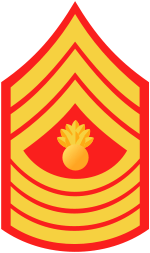 The rank of gunnery sergeant in the Marine Corps was established by the Navy personnel act of March 3, 1899 (30 Stat. L., 1009) reflecting the duties of Marines in ship's detachments. The original insignia was three chevrons point up with three straight "ties" with an insignia of a bursting bomb over a crossed rifle and naval gun. From 1904 to 1929 the insignia went to three stripes only over a bursting bomb on top of crossed rifles. In 1929, like the rank of first sergeant, two "rockers" were added beneath the stripes with the same insignia in the middle. 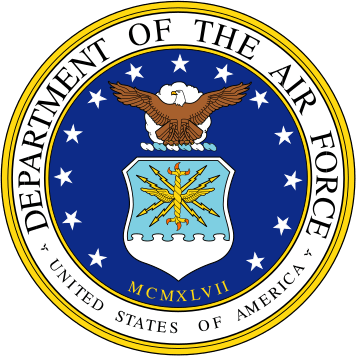 In 1937 the middle insignia was dropped. 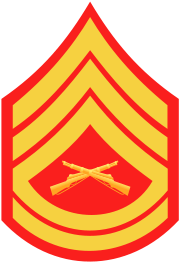 The rank was replaced by technical sergeant in 1946 until restored in 1959, when the crossed rifles insignia were added to Marine chevrons. Gunnery sergeants are men selected from the sergeants of the corps on account of superior intelligence, reliability, and mechanical knowledge. 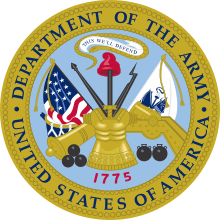 The grade was provided with the idea that they should be somewhat higher in standard than first sergeants; that their knowledge of ordnance and of gunnery should be such that they would be able to make minor repairs to guns—to supervise all work in connection with guns; to command detachments which were of such size as not to warrant a commissioned officer being assigned to them. 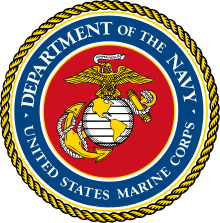 They are at present in command of marine detachments at naval magazines; are performing duty as first sergeants of regularly organized companies at various posts; in connection with the repair of guns at various Marine Corps stations; in connection with the training of recruits; and, in general, performing duties that require the utmost reliability. 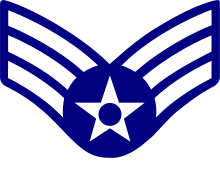 For a number of years candidates for promotion to this grade were required to take a special course of instruction before receiving their warrants, but recently, because of the lack of first sergeants and the numerous small detachments organized, it has been necessary to detail many of them for duty as first sergeants. As soon as there are a sufficient number of first sergeants available, it is intended to reestablish the school and to give gunnery sergeants a thorough course of instruction prior to their permanent appointment to this grade, in order that they may be experts in all matters pertaining to the care and preservation of naval ordnance. GySgt Vincent Carter (played by Frank Sutton) is the drill instructor, and later, platoon sergeant, on the TV series Gomer Pyle USMC. GySgt Emil Foley (Louis Gossett, Jr.) is the drill instructor in the feature film An Officer And A Gentleman, for which Gossett won an Academy Award for Best Supporting Actor. GySgt Victor Galindez, a Gunnery Sergeant, fictional recurring character on the TV series JAG. Gunny who helped the JAG HQ investigate crimes. Later he transferred to a Marine Unit and then the CIA. Special Agent Leroy Jethro Gibbs (Mark Harmon), fictional lead character for the show NCIS, Special Agent-in-Charge and former Marine GySgt well known to high-ranking Navy and Marine officers on the show as "Gunny", a nickname for gunnery sergeants, in the spirit of camaraderie. GySgt Hartman (R. Lee Ermey) was prominently featured in the first half of the Stanley Kubrick movie Full Metal Jacket. GySgt Thomas Highway (Clint Eastwood) is the protagonist of the movie Heartbreak Ridge. GySgt Bob Lee Swagger is the protagonist of the 1993 novel Point of Impact by Stephen Hunter and its 2007 film adaptation Shooter starring Mark Wahlberg as Swagger. GySgt Edward Buck (voiced by Nathan Fillion) is the leader of a small team of Orbital Drop Shock Troopers in the video game Halo 3: ODST. GySgt Nicholas Brody (Damian Lewis) was a prisoner of war and later a U.S. Congressman whose story centres the first four seasons of Homeland, for which Lewis won the 2011-12 Emmy Award for Lead Actor in a Drama. GySgt Asher "Sarge" Mahonin (Dwayne "The Rock" Johnson) is a primary character in the feature film Doom (2005). GySgt Peachey Carnehan in The Man Who Would Be King (film) refers to himself by this rank; his correct rank would be that of Colour Sergeant. ↑ Louis A. DeCaro, Jr. A Shepherd in Harlem: The Life and Times of Ezra N. Williams. Lulu.com. pp. 149–. ISBN 978-1-105-05642-0. ↑ Arelo Sederberg (1 December 2006). Country Music: And Other Stories. iUniverse. pp. 10–. ISBN 978-0-595-42193-0. 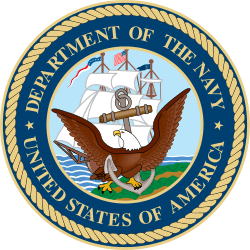 ↑ "Hearings before Committee on Naval Affairs of the House of Representatives". 1912: 514. Retrieved 2010-01-03.